Vicki, who has just completed the Illustrating Children’s books course, has received her final grade and passed with Distinctions. I asked Vicki if she would write a little about her final piece which I have added below. We would like to wish Vicki the best of luck in her future career as an illustrator, we are sure that she will be successful! 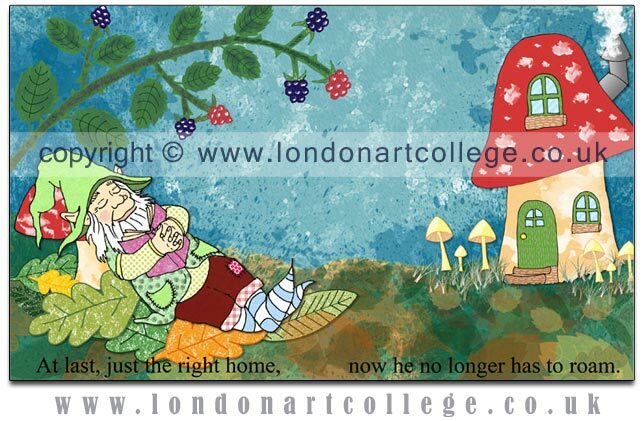 “I began with line drawings of each element (gnome, mushroom house, blackberries, leaves, etc.) which I inked with marker pens. Then I scanned them into the computer and coloured each element. I made a background with lots of textures and then placed my coloured drawings into this, moving them around until I was happy with the composition. I made my own textures and brushes especially for this piece to create a real art look that allows my own style to come through”. The Federation of Children’s Book Groups (FCBG) called today for entries to its competition to design a logo for its Festival of Children’s Literature, to be held in Birmingham on November 9th 2013. Illustrators, established or aspiring, are invited to submit a logo by May 17th. The winning design will be used for all advertising for the festival, not only online, but in print. The winner will be interviewed for the FCBG blog (http://www.fcbg.org.uk/blog/) and newsletter with a opportunity to showcase a selection of their illustration portfolio. The FCBG blog and newsletter are widely read by those based in the UK with links to the children’s book industry; the newsletter goes to more than 1000 people. The online and print interviews will offer an amazing opportunity for the winning illustrator to raise his/her profile within the (UK’s) children’s book world. The logo should capture the excitement of books and the joy of stories, and appeal to all ages. The aim of the Federation, and this festival in particular, is to bring children and books together for enjoyment and fun, whilst celebrating 45 years of the Federation. The logo will need to work well both on screen and in print (on A5 flyers, in addition to text about the festival). web@fcbg.org.uk by 6pm Friday May 17, as either a TIFF or JPEG, at 300dpi. It should be no larger than 100mm x 100mm. It must include some colour, but it is up to you whether it is full colour (4 colour) or uses a limited palette. The winner will be notified by email by May 20th. Shortlisted entries will be shown on the FCBG blog in early June. The winner will be interviewed for the FCBG blog (http://www.fcbg.org.uk/blog/) and the newsletter about their illustration work in general, and will have the opportunity to showcase a selection of their portfolio, if they wish, in addition to the logo as part of the blog and newsletter interview. The interviews will take place via email at the end of May, and will appear online and in the newsletter in June /July. 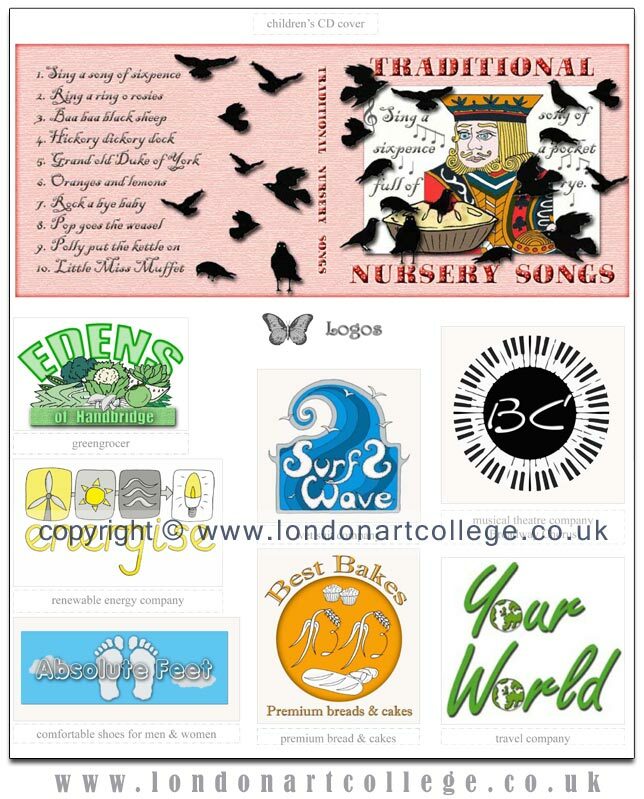 One of our graphic design students has passed her course with flying colours and has been awarded a distinction. Vanessa Weaver, who tutors the Graphic Design Diploma course has sent me some of Christine’s work for the website and you can see two of her pieces below. We featured Christine’s work on our blog recently, if our readers remember, she designed some wonderful packaging for tea. We would like to wish her every success in her future career. A FORMER quiz show hostess who gave up her TV career to move to rural Wales has won a national photography competition with a picture taken only months after she was given a camera. 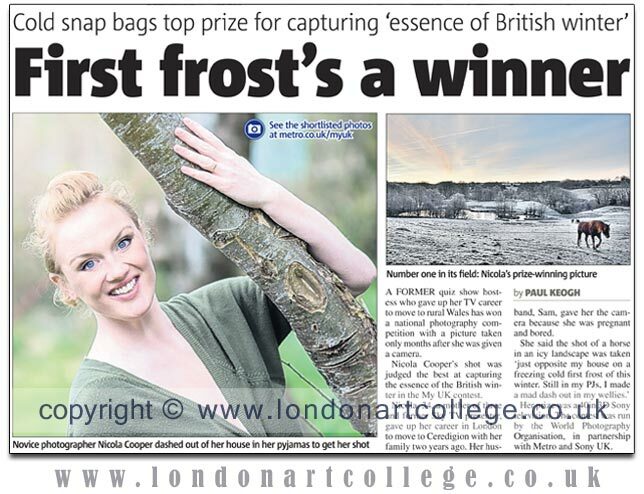 Nicola Cooper’s shot was judged the best at capturing the essence of the British winter in the My UK contest. Nicola, 34, a mother of three and former Sky TV presenter, gave up her career in London to move to Ceredigion with her family two years ago. Her husband, Sam, gave her the camera because she was pregnant and bored. She said the shot of a horse in an icy landscape was taken ‘just opposite my house on a freezing cold first frost of this winter. Still in my PJs, I made a mad dash out in my wellies.’Her prize was a 40in 3D Sony television. The contest was run by the World Photography Organisation, in partnership with Metro and Sony UK. We have received information about a new photography competition. Please remember we are not affiliated with them in any way. If you enter, why not email us your entry so we can showcase it on our blog. If you win…let us know! The theme is ‘Wild’ and we are looking for imaginative interpretations of the natural world, untouched or untamed by humankind. All images will be judged by acclaimed photographer Steve Bloom, and the top 50 images will be selected for the chance to with the ‘WILD PhotoVoice Prize’ and ‘WILD Public Choice Prize’, and will be available to buy through the WILD print sale in an edition of up to 10 for £50 with every penny going to the work of PhotoVoice. A student who is currently studying on the Botanical Course tutored by Sandrine Maugy, has emailed me her most recent work to add to the Student gallery, which I updated today. 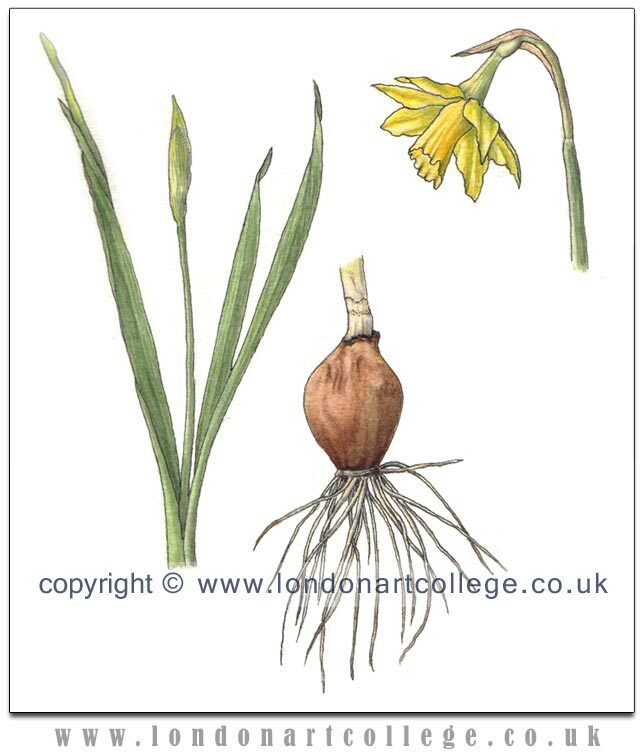 Sue’s illustrations are beautiful and you can see one of them below, along with two other versions of her daffodil in the Botanical Student Gallery. We are really looking forward to seeing Sue develop her work further on the course and can’t wait to see what she produces next! We have just updated our Chinese Brush Painting Gallery with lots of lovely new student artwork, one of which is below. 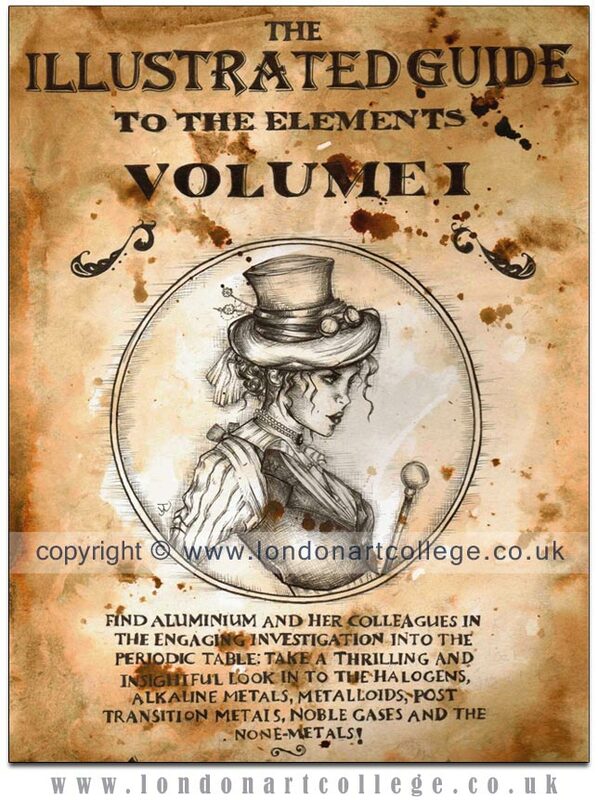 Monika Cilmi, the tutor for the course emailed me some lovely pieces of artwork and this one really stood out for me so I felt it had to be showcased on our blog. This piece is just superb! 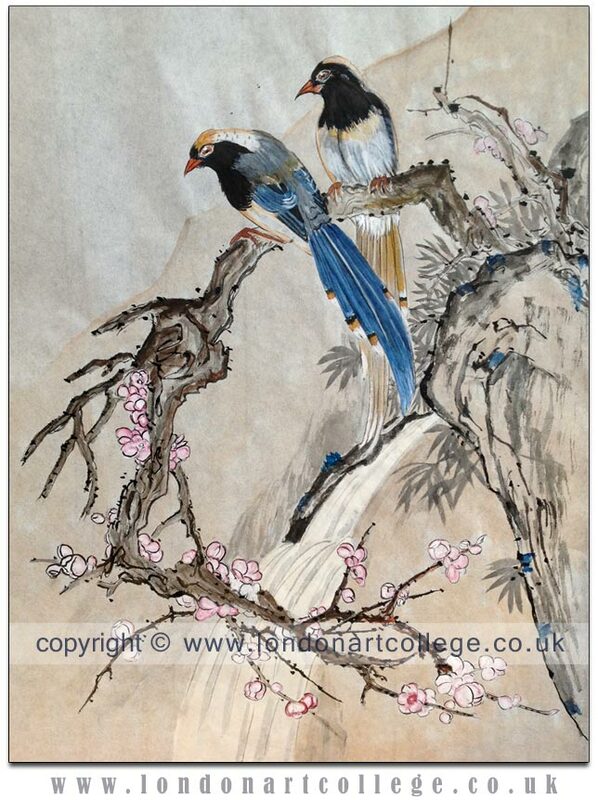 if you are inspired to take a Chinese Brush Painting Course pop over to see the course details and enrol today! This is a piece of work from one of our students studying on the Children’s Drawing course. Catrin has now completed her course and her final piece is below. 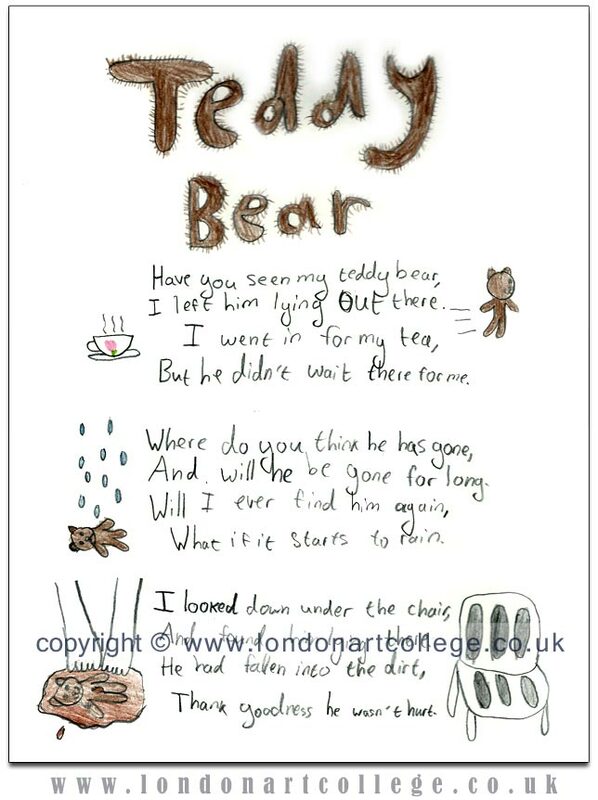 She was asked to illustrate a poem written by Fred Starr and we think she has done a superb job. Do we have any young artists reading our art blog? Why not take a look at our Drawing courses for Children to see if we can help you with your drawing! We have received information above the 3×3 picture show competition for our illustration students to enter. Please note we are not affiliated with this competition in any way. 3×3 magazine is entering its tenth year judging the world’s best contemporary picture books judged by some of the world’s best illustrators, designers, art directors,publishers and editors. Still one of the lowest entry and publication fees around and at 3×3 we judge not only children’s books but also young adults, children’s illustration, editorial, educational and programming. Enter the Picture Book Show. Open to all art directors, editors, designers and illustrators in all countries for commissioned and unpublished work produced in 2012. Children’s Book Published, Children’s Book Unpublished, Young Adult, Book Covers, Children’s Illustration Published, Children’s Illustration Unpublished, Educational, Editorial, Children’s Programming & Animation, Miscellaneous. The 3×3 Illustration Show is the only truly international competition for illustration. No other show is as completely international as ours. While many shows showcase the work of their own country’s illustrators, 3×3 knows no boundaries. Each year we receive entries from all corners of the globe and we’re the only show where the judging panels are truly international. And we’re the only show that puts their exclusive illustration annual coupled with our award-winning magazine on the newsstand at a price that every art director can afford. And with our redesigned size we’re front and centre on the shelf. Greater visibility for our winners. Greater visibility for illustration as a whole.Plus our winners will be invited to participate in our next 3×3 Illustration Directory which is mailed out free to a highly targeted list of 6,000+ art directors and art buyers in the US. And our free app will be available to all art directors and art buyers worldwide.